Faringdon Accommodation - Near The City of Dreaming Spires is located at the south eastern end of the Cotswolds and is of course a main tourist holiday destination.There are a number of places to stay offering accommodation centrally and others located on the outskirts which are ideal for combining touring Oxford City and the Oxfordshire Cotswolds including Woodstock and Blenheim Palace and quaint villages such as Great Tew with its thatched cottages. For those wanting the benefit of nearness to Oxford but strategically placed for touring the Oxfordshire Cotswolds including Blenheim Palace we recommend looking also at accommodation at the following places:- Woodstock, Witney, Burford and Chipping Norton. Welcome to The Bell Hotel, a delightful 16th century hotel, bar and brasserie situated in the heart of the historic market town of Faringdon on the threshold of the Cotswolds. Back in the 18th century the town became a prominent staging post where weary travellers took refuge from the bone shaking roads and enjoyed the comfortable hospitality at The Bell Hotel. That tradition of hospitality continues today at The Bell Hotel as the new management of Glenn Geldard and his team ensure leisure and business travellers receive a warm welcome. The Bell Hotel offers eight spacious and comfortably furnished bedrooms. Full of character, the rooms feature oak beams, ornate plasterwork ceilings and undulating floors – and enjoy views of Faringdon’s Market Place or the hotel’s courtyard. All have a private bath or shower, colour TV, tea and coffee making facilities. Two of the rooms are family rooms with a double and single bed and plenty of room for an extra z bed which can be supplied on request. Family rooms cost £80 per night and can accommodate up to four people. subject to availability, single occupancy costs £55 per night. Breakfast at The Bell is included. he Bell Hotel, Market Place, Faringdon, Oxfordshire. The BEST WESTERN Sudbury House Hotel enjoys a secluded location in the market town of Faringdon, just 12 miles away from Swindon and 17 miles from Oxford. Set in 9 acres of picturesque grounds, the hotel is the ideal place to get way from it all, without venturing too far from the towns and cities of interest in Oxfordshire and beyond. Formerly a regency residence, the BEST WESTERN Sudbury House Hotel offers traditional comfort with modern convenience. Friendly staff and award-winning food & drink make the hotel even more inviting, so be our guest and relax in this wonderful Oxfordshire haven! Nestling on the edge of the Cotswolds, you'll be worlds away from the hustle and bustle of city life. 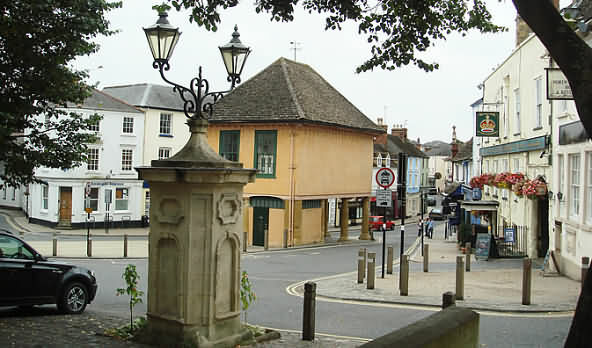 However, historic Oxford is just minutes away by car and Swindon lies within easy reach of the hotel. Ashdene is ideally located on the doorstep of the Cotswolds and within a short drive of some of the most famous historical places in the U.K. Stratford upon Avon, birthplace of Shakespeare, the Roman City of Bath and the ancient stone rings of Avebury are but a few of the wealth of attractions nearby. Whether seeking places of interest for adults or keeping the children amused you will find a wide variety of options on your doorstep. Ashdene, originally 2 working cottages, has been extended to provide modern clean first class accommodation - located only 8.9 miles from Faringdon with very easy access from M4 motorway. With its own enclosed Swimming pool it is in a perfect location for a self catering holiday. It can sleep up to 12 people in 5 bedrooms all with direct wifi access and plasma T.Vs plus a games room to keep the children amused. The Cottage is furnished to a very high standard with 2 En-Suite Bedrooms, Lovely Inglenook fireplace for those cold winter months and set in grounds approaching half an acre. All 5 bedrooms have T.V’s and a socket providing direct Internet access, the utility provides a drying room with Washing machine and Tumble dryer. In the main bathroom is a separate corner shower in addition to bath, toilet and sink. Bedroom 1, 2 and 5 are located on the ground floor with the main bathroom, bedroom 1 has an En-suite, bedroom 2 is a family room with with 2 single beds and bunk beds, bedroom 5 is a double room with a double bed. Upstairs can be found bedroom 3 with a double bed and en-suite facilities, and bedroom 4 has 2 single beds. Pets are very welcome at Ashdene but we have strict rules because of the standard of accommodation, No dogs under 12 months please and only 2 dogs at any one time.